Most authors are pleased when someone sponsors a book signing for them in a bookstore or at a book festival, but few of them have the privilege of autographing books on the porch of a private plantation home as I did this past Sunday afternoon in New Iberia, Louisiana. In an earlier blog, I described Belmont Plantation where the signing took place, but I didn't give much space to the grounds surrounding the old Wyche home. From the porch of Belmont, visitors could see the copse of old live oaks in the front yard, and I sat at a table overlooking the overarching umbrella of trees. 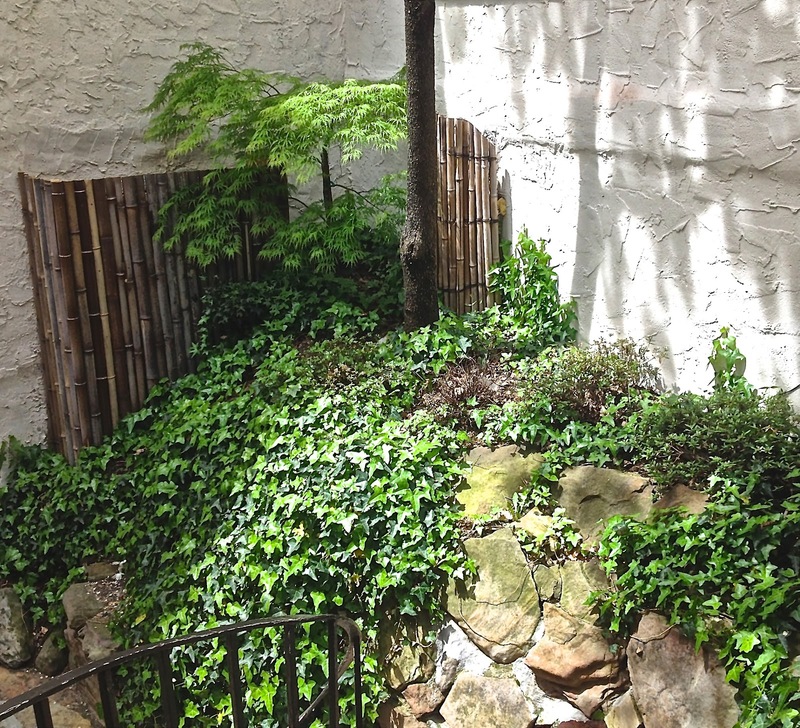 However, I didn't see the grandfather oak on the property until I went around the side of the house to look at Mary Wyche's hidden garden, and I almost gasped at the sight of the Quercus Virginiana standing sentinel over the back of the house. It was grand enough to warrant the photograph in this blog. Louisiana is noted for its oaks, the sweeping limbs of which are often as large as the trunks of other trees, and the weight of the branches brings them almost to the ground. These grand trees aren't cut anymore, but at one time their heavy, durable wood was used to build ships. Today, members of organizations like the Louisiana Live Oak Society would cringe at the suggestion of cutting even one of them. 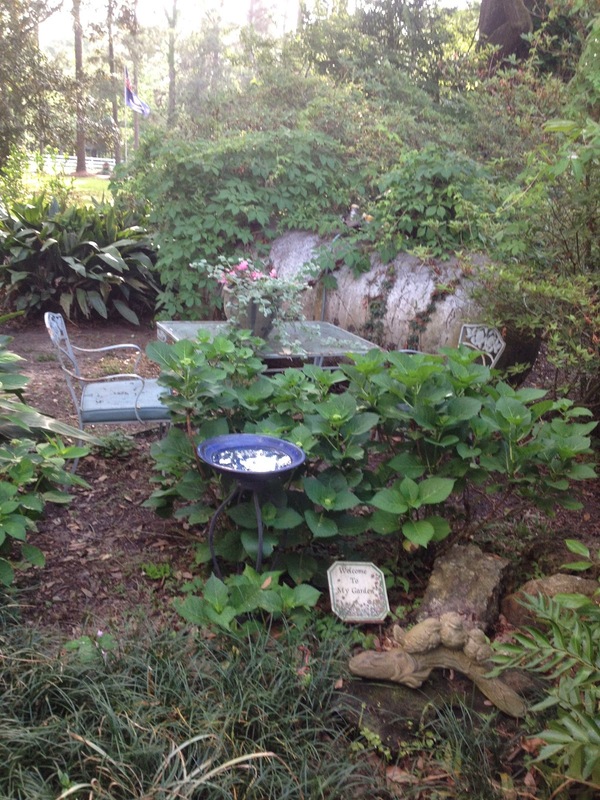 The LLOS has been around since the year before I was born and is dedicated to preserving these Louisiana beauties. One of the organization's registrants is The Seven Sisters Oak in Mandeville, Louisiana on the shores of Lake Pontchartrain, which is 1200 years old and has a girth of over 38 feet! On this latest trip to my home in New Iberia, I found leaves from the live oak in my backyard mounded everywhere and jokingly threatened to cut it down, but when I thought about the shade it provides in humid Louisiana weather, I was sorry to have voiced such sacrilege. Instead, I paid several hundred dollars to have a few limbs trimmed. The worker who raked the leaves accumulated in my yard remarked that last year's acorn crop from the oaks had been abundant, and this year the oaks had shed more leaves than they usually do. He claimed that many of his customers had been felling the trees because of the heavy leaf shedding and last year's plenteous acorn crop. Although acorns and leaves litter the yards of those of us who prefer pristine lawns, I can't imagine ending my prize oak's life—it was once valued at over $25,000! 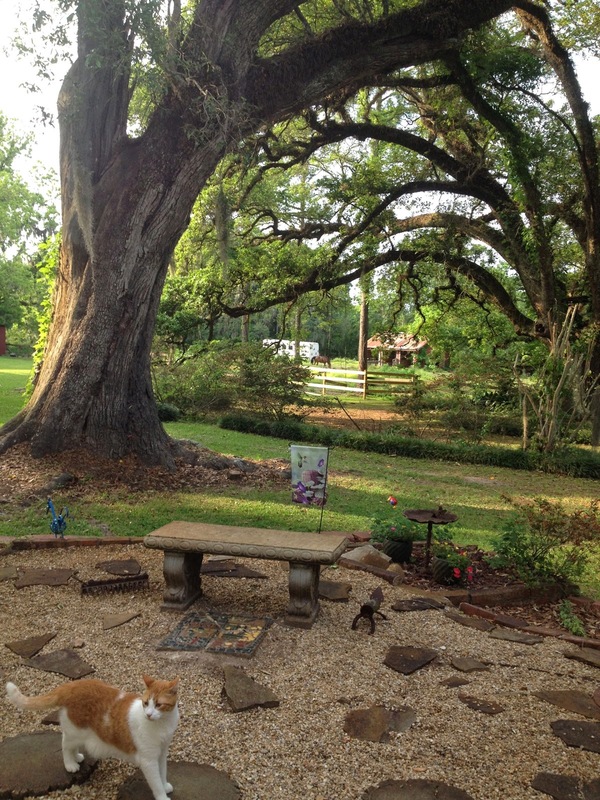 The sight of Mary Wyche's massive oak in the backyard of Belmont Plantation sent me scurrying home to look up Walt Whitman's comments about the oak trees growing in Louisiana. In Leaves of Grass, he extolled the beauty of these trees: "I saw in Louisiana a live oak growing./All alone stood it and the moss hung down from the branches,/Without any companion it grew there uttering joyous leaves of dark green.../And I broke off a twig with a certain number of leaves upon it, and twined around it a little moss,/I brought it away, and I have placed it in sight in my room,/It is not needed to remind me of my own dear friends..."
About the massive oaks around New Iberia, I often say: "If only the old trees could talk, what stories they could tell that I would write about!" This week I left The Mountain at Sewanee, Tennessee to return to my home in New Iberia, Louisiana for a book signing in recognition of the publication of Porch Posts, a book of essays that Janet Faulk-Gonzales and I co-authored. The signing will be held on the long gallery of the Wyche home at Belmont Plantation here in New Iberia, a historic place that was built as the summer home of the last Spanish Viceroy of Louisiana, the legal title of which goes back to a Spanish Land Grant. The Peebles family acquired Belmont in 1829, and it was passed on to John Fletcher Wyche, great-grandfather of Mary Wyche Estes who will hostess the porch party. According to the memoirs of James Wyche, Jr., the original residence at Belmont was a raised cottage type of architecture, a story and a half structure, with a 56' front, two large rooms deep, and a 12' deep front gallery with eight square posts. A back gallery ran "all across, some 8' feet deep within an ell, containing kitchen, provision storeroom and a large room known as the 'ironing room,'" wrote Wyche. The plantation had a water-powered double mill sugar factory capable of serving two series of kettles and also had a distillery for making rum. Belmont has been engaged in growing sugar cane from almost the beginning of the sugar industry in Louisiana, except for intervals during the Civil War when nothing was raised for commercial use. During 1813, the Belmont sugar mill was converted from water power to steam, but the mill did not operate after 1882 and was dismantled. A huge bell is housed in a wooden bell tower that still stands on the property and was formerly used to call field workers to labor or indoors for meals. It's seldom used now, except for demonstrations (at one time, demonstrations of bell ringing were carried out by Frieda, the Wyche dog, who held the bell rope in her teeth and rang the old bell) and for celebration of Independence Day. This Sunday afternoon, after guests have been offered traditional Wyche hospitality of libations and food, Janet and I will read excerpts from Porch Posts, and my essay will highlight Wyche's Happy Hour sessions that were formerly held on the long gallery described above. Both the porch and Wyche family members will lend the appropriate ambience to the occasion—three of the Wyche clan are also authors: Mary Wyche Estes has published Mending of the Heart and Bass Reeves; her brother James Wyche III, published Slice, Dice and Die and Onions Make You Fry; and Guy Estes, Mary's son, has published a fantasy entitled Triad. All of these books deserve a good read. 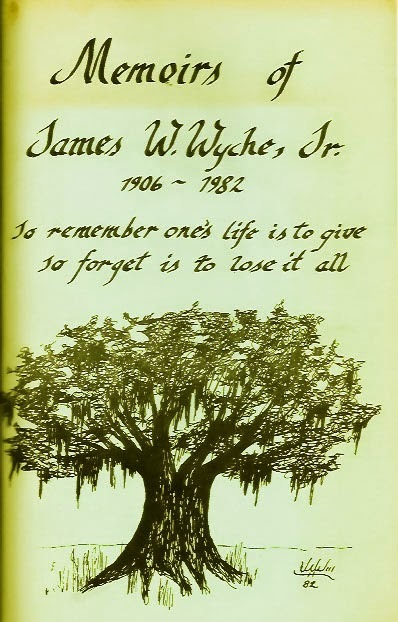 This week, I pulled Memories of James W. Wyche, Jr. from my shelf of books about Louisiana and read a few excerpts to prime me for the Sunday afternoon reading. One of the chapters about the early childhood and boyhood of "Big Jimmy," as I called him, provoked my interest. He wrote: "I would take nothing for my rural upbringing, but then I am probably prejudiced, and rightly so. We would not wear shoes from the day school closed for the summer vacation until it opened in September, the soles of our feet becoming as thick and tough as shoe leather. We all learned to swim at an early age, under my father's tutelage, until he became assured of our proficiency. After that, the bayou became our aquatic playground, even with its immense but harmless gars. Rafts of logs would pass, towed by a steamboat and destined for a saw mill, upon which we would hitch a ride for half a mile, then swim back home. "...My sister, Julia, swam the bayou on her pony, 'Dimple', when she was about five or six, and made the return trip safely. She did not know how to swim a stroke! She dried her clothes on a hickory limb or partly dried them, and the finishing touches and the ironing were done by Annie, our surrogate aunt whom I have mentioned before. I doubt very much that Mama knew of the incident until years afterward, or history would probably have been changed at that very juncture..."
The above excerpt was one of the stories told on the porch at Belmont, and was accompanied by a mint julep and the convivial spirits that always prevailed at Big Jimmy's Happy Hours. I look forward to the party for Porch Posts and the reunion with old friends under the oaks at Belmont, and I wish that Big Jimmy, his sister Julia, and wife Arleen could join us while we sit on the porch and enjoy another memorable Happy Hour. During Morning Prayer at St. Mary's Convent, Sewanee, Tennessee this morning, I looked out the window and saw snow falling on the valiant, blooming redbuds and dogwoods which had just come into their own. It's Holy Week, and a "dogwood winter" has descended on The Mountain, with below freezing temperatures predicted for tonight. Carol, who cooks for the Convent, assured us that the snow is just passing through, and by the end of the Eucharist, the sky had cleared of snow... and now an icy rain is falling. I love the way the snow looks on the trunks of the myriad dogwoods scattered throughout Sewanee, but we had no warning that a dogwood winter would assail us. Sunday afternoon we went down to Chattanooga, which seethed with 82-degree weather (well, that's hot here in middle Tennessee!) and spent the afternoon strolling around the Bluff View Art District, known not only for its visionary arts, but for its culinary art as well. The District sits atop a bluff overlooking the Tennessee River and is our favorite area in Chattanooga. After lunching at Tony's Italian Restaurant, we meandered through the River Gallery and the Huntington Museum where regional and national artists are featured, but we were drawn outdoors to take photographs of the pink dogwoods and of other foliage in the little alleyways that wind behind the River Gallery. 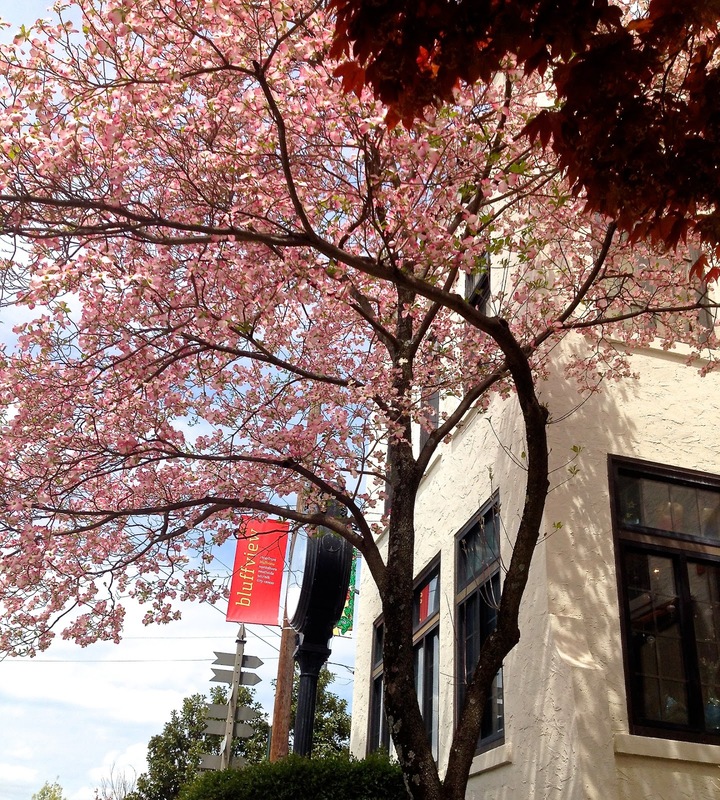 We paused before a dogwood near the Rembrandt Restaurant where we sometimes eat European style pastries and drink Expresso coffee outdoors under bright umbrellas. I've written a few poems about the birds that flock to the outdoor tables while we're eating, and I always notice people scribbling on pads as they sit in the sun enjoying the European ambiance of the place. I imagine them as fellow poets who're writing about the "light that exists in spring/not present on the year" (in the words of Miss Emily Dickinson) and have scratched similar lines on napkins while sitting at a Rembrandt table. 'S hard to resist doing something artistic in this setting! 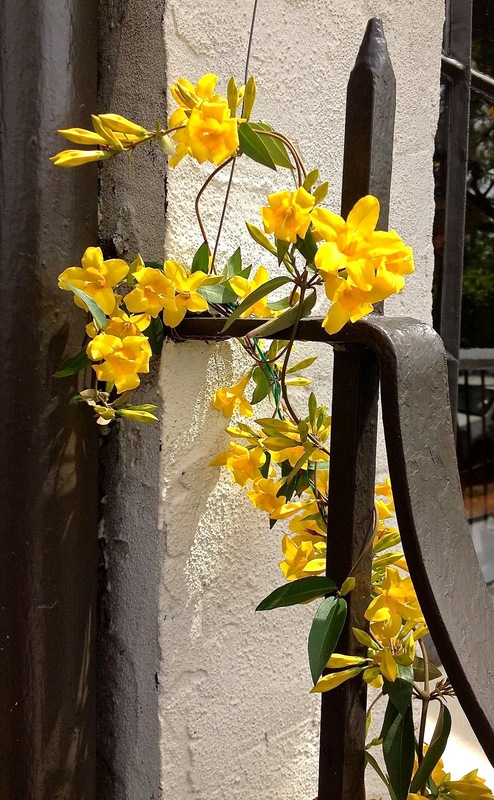 We found it difficult to leave the city on such a sunlit day, so we prolonged our visit by going down to the Whole Foods Market where we discovered organic and local produce, grass-fed meat, and an opening sale of spring flowers. The large display of orchids in this wonderful marketplace prompted us to buy a tall, deep purple one to deliver as an Easter gift for a shut-in friend at Sewanee. The Sunday afternoons of my childhood were always times that I labeled "inertia," as they were devoted to adult naptimes or, in the case of visits to my hardshell Baptist grandmother, they were periods when we observed the Sabbath by avoiding any kind of happy activity that might be regarded as disrespectful of the day — solemnity, quietude and utter boredom prevailed! Now, when sunny spring weather beckons, I'm likely to indulge the "play impulse" and my ubiquitous wanderlust on Sunday afternoons, and Chattanooga always satisfies both tendencies. Although I read and write poetry every day, every month in the year, I'm always excited to see that the Academy of American Poets commemorates April as National Poetry Month. The Academy has been sponsoring this observance since 1996 and encourages schools, libraries, publishers, and poets to celebrate poetry during April through readings, workshops, and festivals. This year, members of this supportive organization have suggested that poetry lovers carry poems in their pockets and read them during casual encounters with friends, co-workers, and other people they meet on the street on April 24. I own approximately 400 books of poetry and house most of them in my bedroom here at Sewanee, Tennessee, and when I'm in Louisiana, I suffer pangs of withdrawal from the lack of availability of my books. However, right now, just as the "blooming yellows" appear—daffodils and forsythia, our first signs of spring—I'm in my Tennessee poetry library again and am happy to be in the company of bards ranging from Shakespeare to Charles Simic. I teethed on Robert Louis Stevenson's A Child's Garden of Verse, thanks to my mother, memorized Henry W. Longfellow's poems in the third grade, and had an epiphany about becoming a poet when I was eleven. The epiphany occurred as I was sitting at one of those old fold-up seat desks reading "Hiawatha," and as I read the poem, I experienced the same sensation that Emily Dickinson said she felt when she read a good poem—as if the top of her head had blown off. I also received the revelation that I could write a poem. We had just moved into a new stucco bungalow in Franklinton, Louisiana, and I wrote the poem about this new home, the sight of which gave me an overwhelming feeling of security after traveling in the West the preceding summer, "gypsying," as my wanderlust father described my childhood odyssey to California. I only remember that two of the lines of the poem I wrote described the home as being "away from the town's noisy din/safe from the roar of the cotton gin," unimpressive lines to mark the advent of the life of a poet, but enough expression to make me think that I could write poetry. And, by the way, this early effort is one of the few rhyming poems I've penned during my lifetime. I didn't become serious about writing poetry until I was 29, and my first published poem appeared in The American Weave in 1967 when I was 32. I was paid from the Hart Crane Memorial Fund and felt as though I had arrived in the world of poetry. 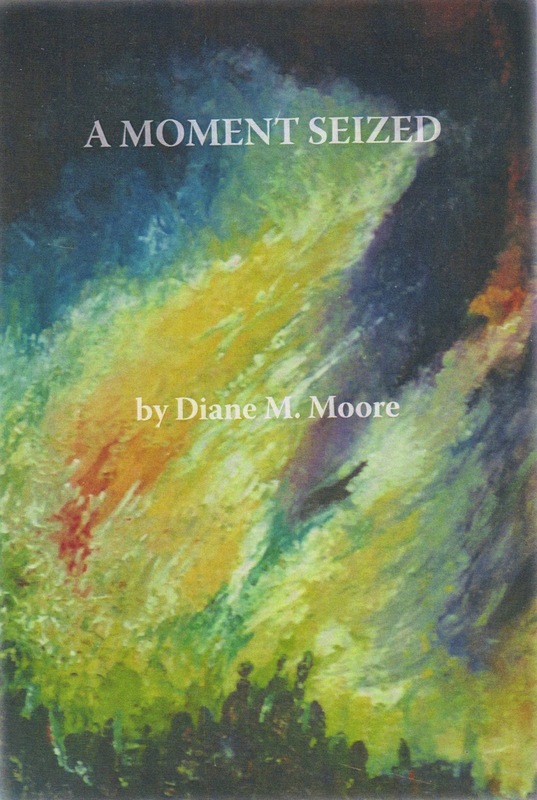 Five years later, I received an award for inspirational poetry during the Deep South Writer's Conference but, again, time passed and I read more poetry than I wrote. During the early 1970's, I became serious about writing poetry while I sojourned in the desert of southern Iran and have remained dedicated to the craft and to publishing my work for almost forty years. A friend once told me that no one is successful at any endeavor until they put in their 10,000 hours of practice, and I think that measure is probably a good marker for success in writing poetry that engages people. A better measure is that of writing a poem a day, and I feel that the ritual of writing is a spiritual act, as well as an act requiring discipline and study. My poems will probably never be recited by third graders or sit on the shelves of academicians in the university realms, but the writing of them is still as exciting as the day I wrote that first poem when I was eleven and said to myself: "I can do that! For me, poetry provides what Jacque Maritain declared: "You cannot attain eternal life through poetry but it is as essential as bread to the human race as it fits us for the life of the spirit." 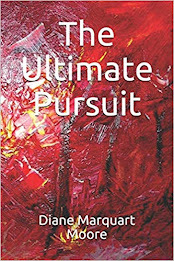 PUBLISHED POETRY BOOKS OF DIANE MARQUART MOORE: In A Convent Garden and Other Poems; Mystical Forest; Everything Is Blue; Post Cards From Diddy Wah Diddy; Alchemy; Old Ridges; Rising Water; The Holy Present and Farda; Grandma's Good War; Afternoons in Oaxaca; The Book of Uncommon Poetry; Counterpoint; Your Chin Doesn't Want to Marry; Soaring; More Crows; Just Passing Through; The Beast Beelzebufo (children's poetry); and A Moment Seized. 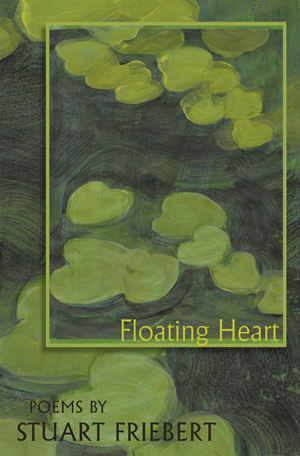 Poems have appeared in The Daily Iberian, Yaddasht Haftegy, American Weave, Trace, Pinyon Review, Interdisciplinary Humanities, Southwestern Review, and other journals.